A geisha, also known as a geiko, is not only one of the most mysterious and alluring aspects of Japanese culture but also one of the most misunderstood. If you spend some time in certain areas of Tokyo, Kanazawa or Kyoto you are bound to see one of these mysterious girls. They’re pretty hard to miss with their colorful kimono’s, white painted faces, red cherry lips and beautiful hairstyles. In this article we will help demystify geisha culture by revealing what they actually do and by learning more about their clothes, makeup and hairstyles. 2: What do geisha’s do? 3: What do geisha’s wear? 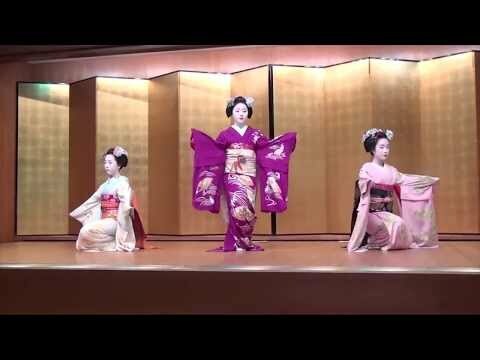 Three geisha’s doing a dance performance. Video is owned and created by Zoran Mlinarevic. In Kyoto, a maiko is an apprentice who has to complete 5 years of training in a number of arts before she qualifies to be a geisha. Albeit, in Kyoto a geisha is called a geiko whilst geisha’s are known as such everywhere else in Japan. The word maiko is also only used in Kyoto and they are known as hangyoku everywhere else. Geisha (geiko) are trained in various arts in order to entertain mostly wealthy clientele. Clients will either visit them at a traditional tea house known in Japan as an ochaya or at a traditional Japanese restaurant called a ryotei. A geisha is expected to engage her clients in playful conversation and should be knowledgeable enough to be able to talk about most topics. In addition, she knows a number of drinking games which she will use to entertain her clients such as tora tora tora and konpira fune fune. These games are known as Ozashiki asobe (party games). Tora tora tora: Tora tora tora translates to tiger tiger tiger and is a form of rock, paper, scissors. The geisha will sing a song while two people hide behind a Japanese folding screen. Once the song is over the two people will emerge from behind the screen as either a samurai warrior, tiger or old woman. If a samurai the geisha will beat you with a stick, if a tiger it will eat the geisha but then the samurai will strike the tiger down with his sword. The old woman is stronger than the samurai but not stronger than the tiger. And although the game sounds strange its actually a lot of fun to watch and play. Konpira fune fune: The konpira fune fune game involves two people facing one other with a cup on a small table in between them. The konpira fune fune song is sung by the geisha while each player touches the cup in turns with the tempo of the song. Any player can pick the cup up at anytime and upon doing so the other player has to immediately make a fist on the table. Failing to do so or placing an open hand instead of a fist onto the table results in a loss and the loser has to drink a cup of sake. Tosenkyo: Tosenkyo is a much simpler game and involves the geisha placing an object on a stand. The objective of the tosenkyo is for the player to knock this object off from its stand by throwing a hand held paper fan at it. The shape of the fan makes this rather difficult because it doesn’t serve as an effective projectile which makes the game of tosenkyo all the more challenging. Tea ceremonies are the main tasks of a geisha and involves the cultural preparation and presentation of matcha green tea. Learn more about the tea ceremony here. The way a geisha dances is very different to Western style dancing. It consists of a number of meaningful gestures and poses. Each movement has meaning and the whole dance actually tells a story – a story you can understand if you learn to read the symbolic meanings behind the poses. A maiko will learn to play multiple traditional Japanese musical instruments as part of her training. These instruments include tsuzumi drums, the shakuhachi bamboo flute, the shamisen and the national instrument of Japan – the koto. Clients phone the kenban, which is a geisha union office, to make a booking. The service is not cheap and they do not charge by the hour. Instead, these services are charged for via the hanadai (flower fees) system. It works by lighting an incense stick and when the stick has burnt out, time is up. A lot of work and effort goes into creating the geisha look. Here we will discuss some of the clothing and accessories they utilize. Both geisha and maiko wear kimono’s and one can tell the two apart by their clothes. A maiko wears a brightly colored kimono with short sleeves and elaborate patterns. She will also wear an obi which must have brighter colors than her actual kimono. On the other hand, the kimono of an established geisha has much more subdued colors and patterns with longer sleeves. Just one of these kimono’s can easily cost upwards of $30,000. In addition, for a geisha or maiko to apply makeup and get dressed into a kimono can take up to 3 hours. Many fail to realize how much actual effort goes into creating so much beauty. Okobo’s are shoes with high wooden platforms which are strictly worn by maiko’s. A geisha will wear what is known as a zori or a geta. These shoes look similar to the okobo but sits much closer to the ground. Both geisha and maiko will wear the famous white split-toe tabi socks. If you have spent enough time in Kyoto you would have occasionally seen geisha and maiko’s with handheld paper fans. These fans are multi-purpose tools as they serve many functions. It helps with keeping cool on warm summer days and nights, thereby helping prevent their makeup from running. They also serve as essential props during performances. Lastly, many people do not know this but these hand held fans have secret compartments which stores makeup. The oil-paper umbrella is one of the most iconic geisha accessories. These umbrellas originated in China but quickly became common items throughout East and Southeast Asia. In Japan these umbrellas are known as wagasa (Japanese umbrella) and are made slightly different than the ones found in other parts of Asia. The paper used comes from the Gifu prefecture and is known as Meinong paper while the incredibly sturdy handle and scaffold is produced from Kyoto bamboo. Geisha’s are known for their exquisitely beautiful and somewhat complex looking hairstyles. These hairstyles were first popularized during the Edo period and were not only popular among geisha but also with courtesans, teenage girls and ordinary women. You can tell a lot about a geisha just by looking at her hair as there are six variations of the hairstyle which you will see below. The wareshinobu hairstyle is strictly worn by maiko’s during their first 3 years of training. It features a top bun with the rest of the hair forming another bun at the base of the neck which is tucked in underneath the top bun. The top bun is partially held in place with a red cushion as you can see in the picture on the right. It’s a difficult hairstyle to pull off and can be recognized by a red silk ribbon woven through the top bun which runs down to the bottom bun. The wareshinobu hairstyle is also adorned with decorations which reflect the season. In the past, a maiko would only change her hairstyle from wareshinobu to ofuku when she lost her virginity or if she was accepted as a mistress. In those days the hairstyle was considered a major source of embarrassment. Today however, a maiko gets the ofuku hairstyle when she has completed her 3 years of basic training (usually around the age of 18). It signifies her transcendence from junior to senior maiko. The ofuku looks very similar to the wareshinobu. The only real difference is that the top bun is a little smaller and there is no red cushion to hold it in place. A chirimen tegarami, which is a piece of triangular cloth, sits in the small space between the top and bottom bun. The color of the chirimen tegarami is usually red but other colors signifies the maiko’s rank. The katsuyama hairstyle is worn once a year by senior level maiko’s during the Gion Matsuri festival in Kyoto. The hairstyle is named after a well known courtesan from 17th century Japan and was popularized during that era among married Japanese women. The easiest way to recognize the katsuyama is by the elaborate hair decorations known as kanzashi, which goes through the top bun and around its sides. Also, the bun is longer than the other styles and therefore less round. A maiko with the yakko-shimada hairstyle. Image from https://www.japanpowered.com/. The yakko-shimada hairstyle is worn by senior maiko’s three times a year on special occasions. These above mentioned special occasions include the period over New Year’s, Setsubun (the eve of spring) and Hassaku (the giving of thanks ceremony). The hairstyle itself features the usual two wings with a bun on the top. The only differences are the choice of hair ornaments (which also depends on which of the three special occasions it is) and a ring of corals which divides the bun into two sections. A geisha with the sakkou hairstyle. Image from https://www.japanpowered.com/. When a senior maiko completes her apprenticeship she partakes in the erikae ceremony which signifies that she has officially become a geisha. This is when she gets the sakkou hairstyle which she will wear for one month. The sakkou hairstyle is just as beautiful as it is difficult to explain but it’s basically the hair being pulled up and twisted into loops with a small ponytail hanging over the back. There are various hair decorations which go along with the sakkou style, with the most prominent ones being a tortoise shell kanzashi, three red ribbons in the front and thin silver ribbon strips at the back. When a maiko becomes a geisha she gets to wear the taka shimada hairstyle. Interestingly, she can have any hairstyle she wants but when at work, wearing the taka shimada wig is mandatory. The wig is called a katsura and each geisha’s wig has been custom made to fit their heads. The katsura, which is made from real human hair, has wings on each side which sits at nose level while the hair at the back hangs very low; almost covering her entire neck. The next time you see a geisha, pay careful attention to see if she has silver decorations in her hair. If she has then she is dependent on her okiya and if she doesn’t then she is independent. Geisha’s and maiko’s are known for their pale white faces, cherry red lips, crimson eye shadow and black eyebrows. Not only does this make them stand out but it also greatly adds to their beauty and overall appeal. Below we will discuss oshiroi and ohaguro. Oshiroi is the white face powder you see maiko’s always wear. The main ingredients used in the powder are zinc oxide, kaolinite and calcium carbonate. These ingredients are harmless but this wasn’t always the case because up until the start of the last century, ingredients such as mercury and lead were used. Luckily, the use of these toxic chemicals were discontinued as soon as it was discovered how harmful they are. The word oshiroi literally translates to ‘white powder’ and is used today by geisha’s, maiko’s and kabuki actors because of its association with beauty. A maiko with ohaguro teeth, about to become a geisha. Image by Michael Chandler. Ohaguro, which translates to ‘blackened teeth’, used to be common practice for centuries in Japan. It’s believed to have been derived from an ancient Buddhist believe which states that white teeth resembles the raw animal nature of humans and that one should have black dyed teeth in order to be civilized. Female members from the Japanese aristocratic class started this trend sometime between the 8th and 12th century. It wasn’t long before ohaguro became a sign of beauty and became common practice among women in search of a husband, courtesans and geisha. The practice, more or less, came to an end at the start of the Meiji period during the mid-19th century. It’s still possible to see some geisha in Kyoto today sporting the ohaguro look; other than that, kabuki actors blacken their teeth for certain plays. Here we have listed the only six geisha districts of Tokyo city..
Geisha originated in Kyoto. Check out the four districts that can be found here..
Kanazawa, often refered to as ‘Little Kyoto’ has three geisha districts. See them here..
Kyotokimono-rental.com provides some useful information on how to apply geisha style makeup which you can read here. Read more about the style of kimono’s geisha’s wear at japanpowered.com here.